This is the second in a series of blog posts that talks about Reinforced Solder Preforms for High–Reliability and Low Voiding. This post will focus on the technology advancement of InFORMS® and their role in high-power applications. InFORMS® are a patented technology that comprises a high melting-point metal stand-off within a traditional solder preform. The solder can be any alloy currently used in electronics - SAC305 is common. The stand-off thickness is very precise because it is based on the desired final solder joint bondline. 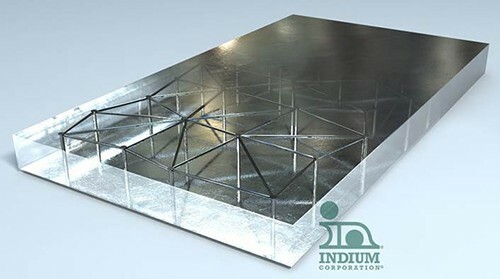 These preforms can be flux-coated for the application if needed . A representative image of the InFORM® is shown below. During reflow, the solder melts and forms the intermetallic bond with the component and board. The component collapses during reflow. Since the stand-off material has a higher melting-point, it does not melt at the soldering temperature. Therefore, the collapse of the component is limited to the thickness of that stand-off. The final bondline will remain consistent because the stand-off material is manufactured to a precise thickness that is uniform across the entire solder area. The InFORM® can be manufactured in a variety of ways. The thickness of the stand-off material is critical and needs to be specified based on the desired final bondline; thicknesses of 0.004, 0.006, and 0.008 inches are common. Additionally,the solderable area around the stand-off is also important. The openings can be sized to suit the design of the stand-off material. The overall thickness of the preform and the quantity of flux are also very important. The preform thickness must be greater than the stand-off. For example, if you select a 0.004-inch stand-off, the overall preform must be at least 0.006 inches thick. If you are using a flux coating on the preform, it is important to understand that the quantity of flux can impact solder wetting and voiding. My next post will talk about bondline consistency and why it is important.